NOTE: The story extracted from Old School English Text Book of Class VII. The book is now out dated. Once a naughty boy went into the woods with his catapult. He saw an owl sitting among the branches of a tree and shot a mud-pellet at the bird. The pellet entered the owl's body and gave him great pain. He went to his friend, the crow, and asked him for help. "I'm sorry I'm not a doctor, and am not going to be one either," the Crow said. "But I can take you along to my friend, the cuckoo. He is a clever doctor.' The owl looked happy. He went to the cuckoo with the crow. The cuckoo did not like the owl at all. "I've known the owl for years," he said; "he'll get well but never care to pay my fee." The owl felt unhappy at the cuckoo's remarks. The crow became sad too. But he promised to get the fee from the owl and pay the cuckoo. That decided the matter. The owl took the cuckoo's advice and sat in a pool of water. Soon the mud-pellet dissolved in the water and the pain stopped. But the owl did not feel quite happy. This treatment is very simple and I knew it well enough. Only, I did not remember it, he said to himself. Soon it became dark and the owl went back his nest. After a while the cuckoo paid him a visit. "And how is my little patient feeling now ?" he asked the owl. "Oh, quite well, thank you," the owl replied. The cuckoo looked pleased and put his foot out for the fee. But the owl seemed not to follow the Cuckoo's hint. “What a beautiful leg," he only said. The cuckoo tried other hints, but they all seemed useless. At last he said in an angry voice, "And when are you going to pay my fee ?' "Your fee ?" replied the owl, "I can't Surely pay you any fee for that simple cure. Really the pool water cured me, not you." He then drove the cuckoo out of his nest. The cuckoo arrived home late in the evening. He was burning with anger. It became darker and colder. but he could not stay inside. He flew out to see the crow. At the door of the owl's nest the crow cried, “Caw, Caw, Caw,' but there was no answer. The nest was empty. The Cuckoo became still more angry. "I want my fee only," he said to the crow. "You promised to pay it. Please pay it now." But the crow could not pay. He was very very poor. At last the cuckoo took the matter to the parrot, the judge. The judge heard everything and declared; The crow promised to get the fee from the owl and pay it to the cuckoo. Now the owl refuses to pay The crow is really very poor and can't pay it himself. So he'll do a service to the cuckoo. He'll look after the cuckoo's eggs. The crow agreed to do this service to the cuckoo, but was angry with the owl. He wanted to kill the owl. So the owl's life is in danger. He hides himself in fear in the hollows of trees and never comes out in the day time. To be safe from the crow, he comes out only at night. The crow still looks after the cuckoo's eggs. 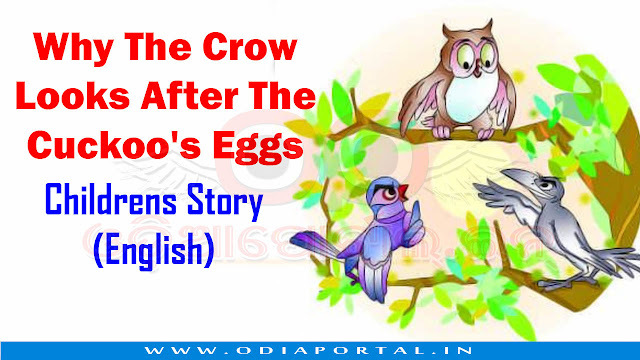 ### The Story (Entire Book) Submitted By "Sri Sugyani Biswal", Talcher, Angul, Odisha.